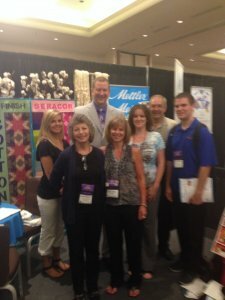 Above & Beyond Sewing and Vacuum has been meeting the home sewing needs of the Denver area since 2005. We offer three convenient store locations, in Thornton, Littleton and Centennial, where you'll find the most experienced staff in Colorado, as well as the friendliest store culture around! As an authorized dealer for Baby Lock, Miele, Dyson, and Simplicity, we carry a full line of sewing, embroidery, and serger machines, as well as providing qualified repair services on all sewing machine and vacuum makes and models, with a one year warranty on most services. We offer the largest selection of sewing and quilting classes in Colorado, all taught in a casual, no-pressure environment that cultivates creativity and achievement in sewing enthusiasts of all ages, styles, and skill levels. We're dedicated to providing our customers with the sewing solutions they need to bring their creative ideas to life. With a staff of industry experts who have over 100 years of combined experience, we specialize in exceeding customer expectations through product knowledge and training, prompt, individualized customer care, ongoing support, and exceptional service that’s unique to Above & Beyond!